I do not know how long I have been sleeping on this spot but the food here is really great, thanks to my man KG for the intel. First off, the atmosphere is a little odd. It sits in the lobby of this hotel/apartment building/bed and breakfast place. 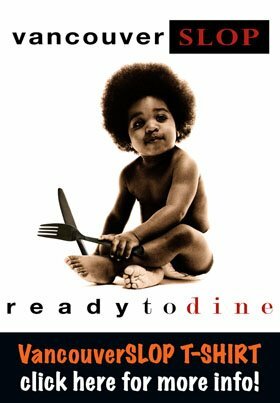 My man KG describes it as a fish and chips spot turned into a Japanese restaurant. You will easily miss this spot if you were not looking for it when driving by. 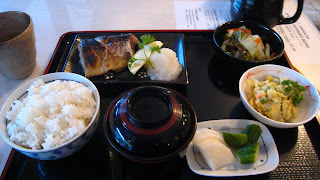 The food was excellent, Japanese home style cooking (similar style to Hachibei and Yoshoko ya). 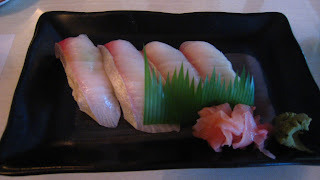 We started our dinner off with the amberjack sashimi (4pcs for 7.95) which was flown in from Japan. I have never had amberjack before so I have no reference to compare it to but it tasted great, amazing texture and no fishy taste. It was really good quality fish. 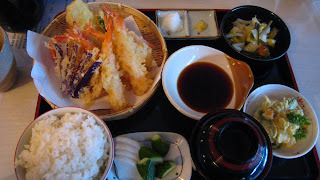 As a main dish we ordered the tempura dinner and grilled saba (but there was choice of grilled salmon or sanma). As you can tell by the pictures the meal comes with various sides (rice, curry potato salad, organic miso soup, daikon and cucumber and a pickled vegetable dish). This was the tastiest miso soup that I have ever had. The tempura was really good, the dish even came with the horse radish and ginger to put in your tempura sauce. We also ordered the saba which was super tasty and not too dry, best saba I have had so far. The dinners were about 13 dollars per plate which is a bit more than Yoshoko ya but I do feel the quality of the food is better, but I love Yoshoko ya's salad. Try this place out, it is definately worth a visit. I will be back so you will see pictures again. Someone said these were the previous owners of hachibei. There is a sandwich board outside that marks the spot but otherwise the restaurant is hard to find. If it was on main street this could be the new Pings.